Puff Paste Take one lb of flour, two ounces of Butter, rubbed in the flour, mix it with cold water, & twelve ounces of butter rolled three times in the paste; bake them in a hot oven; also betwixt every roll of paste, if a little eating oil was sprinkled all over, it would cause the paste to be shivery, and of a fine bright colour. observe, that a very little of the volatile salts dissolved in milk, mixed up with the above, will make the paste much lighter, & look more beautiful; & it will have a great effect in puffs of all kinds; for butter without it cannot make them quite perfect. 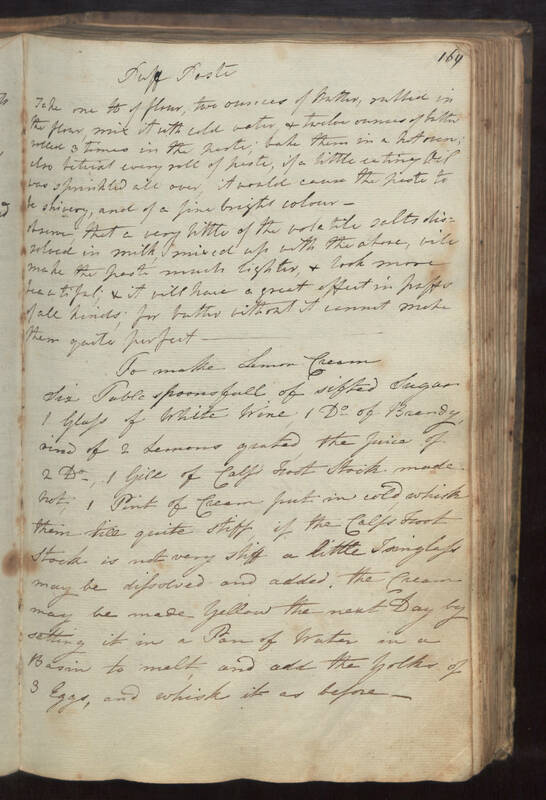 To Make Lemon Cream Six Table spoonsfull of sifted sugar 1 glass of white wine, 1 Do of Brandy, rind of 2 lemons grated, the juice of 2 Do, 1 gill of Calfs foot stock made hot, 1 pint of Cream put in cold, whisk them till quite still, if the Calfs foot stock is not very stiff a little Isinglass may be dissolved and added. the Cream may be made yellow the next day by setting it in a pan of water in a Basin to melt, and add the yolks of 3 Eggs, and whisk it as before.